A friend just sent me a link to a new indie game called the Graveyard. Huge praise goes out to the creators of this interactive work that touches on the ways in which death moves us. This interests me in part because I’ve talked off and on about “a game about death.” Talking to MTV on a panel with Will Wright, Cliffy Blezinski and David Jaffe, I mentioned that I’d be fascinated for personal reasons with a game depicting a human character at successive stages of life, dealing at each stage with a death and with the ongoing ravages of physical deterioration (altering the player-character’s movement model). But while I was wanking about, the creators of the Graveyard created something interesting. Today I played around with the trial version of the Graveyard, then bought the full version for $5. Hopefully, others will check it out. 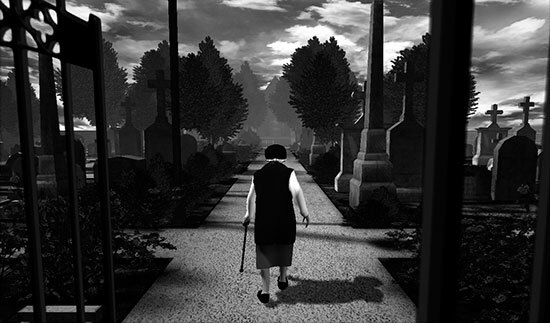 The Graveyard has great presentation, in terms of graphics and audio (including the music). I did walk off screen once and couldn’t recover. And while I appreciate the approach of not over-informing the player, I’d have liked more info on the controls. (It took me a while to figure out how to exit even.) The biggest critique of this (brilliant) indie work is the lack of interactivity; it’s not quite “a series of interesting decisions.” But I find it completely heartening that the game industry is rapidly broadening to allow for creative works like this, along with Facade, the Marriage, Passage, Braid and the like. In my dreamworld, there’d be an expanded version of the game, wherein the player’s goal was to die with contentment. Imagine a faintly saturate bubble around the main character, with a little color…the last shreds of her vitality. Full exploration of the graveyard would reveal similarly hued areas in an otherwise black and white world; each colored spot would mark the grave of someone lost to the old woman, with whom she had an unresolved conflict. Each of these graves would represent a pocket world, a window into her past that would allow her to try, in her mind, to resolve the conflict she had with someone now gone. Imagine a room in the 1920’s, where she argued with a lover for the final time. Imagine her sitting on a boardwalk bench, fighting with her best friend over someone they both wanted to date. In another spot, she remembers a bitter fight with her youngest child who was never happy. The core game loop would, of course, be a challenge, but I would love to see her success in her last hour on the planet be driven by how successfully she came to terms with these past conflicts. With the passage of time and the emotional exertion of dealing with each memory, she’d get closer to death; with the successful resolution of each past conflict, she’d get closer to contentment. The game could then end with a discontent or content death. In any case, I love the Graveyard and wanted to pass this along. Kudos to the team. This entry was posted in Games, Life, Videogame Industry by Harvey. Bookmark the permalink. Thank you, Mr. Smith. It’s really heart-warming to feel so appreciated.